Wide Range Compatibility: For iOS, Android, Windows and smart device which support bluetooth. Wide Range Compatibility: Universal bluetooth 3.0 keyboard compatible with all iOS, Android, Mac and windows. Fits for all version iPad, all version iPhone and android smartphone. Portable Design & Lightweight: Ultra-slim design makes for easy portability. weights lighter than a standard magazine, durable enough to travel. Thanks to the triple fold design, this keyboard can be folded and it's so easy for your stow in your backpack or briefcase. Magnetic Intelligent Power: Features built-in magnet keeps the pocket keyboard folded and maintain the battery life to turn it off automatically when it's been closed. 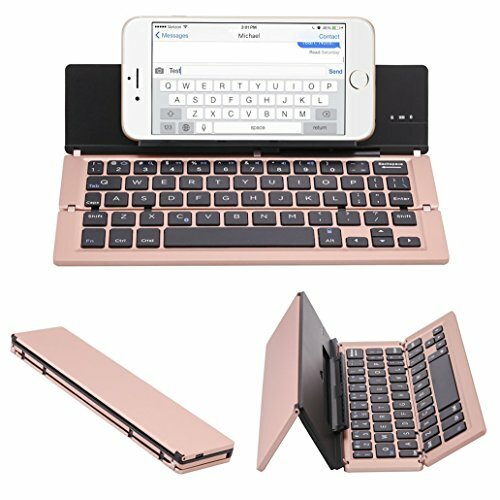 Aluminum Alloy Housing with Kickstand Holder: This bluetooth keyboard housing is made of premium ALUMINUM ALLOY makes it smoothly and luxury. Built-in Kickstand holders to hold and prop up your device, you can use your iPad, tablets and smartphones at an ideal viewing angle with the adjustable stand. Rechargable Power Supply: Features built-in 400mAh rechargable battery,(package with USB charging cable), It will lasts up to 15 days for continuous-use. If you have any questions about this product by Lucky2Buy, contact us by completing and submitting the form below. If you are looking for a specif part number, please include it with your message.